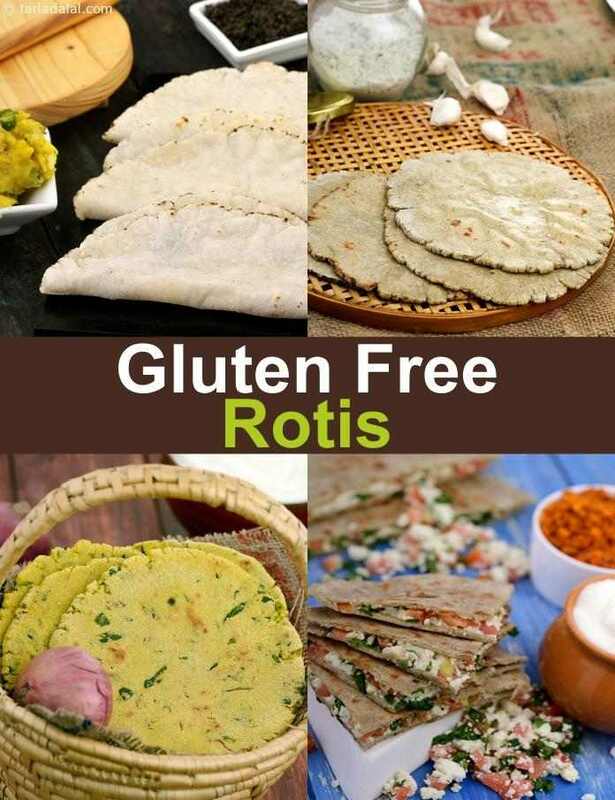 An Indian meal never seems complete without rotis, so it is natural for gluten-intolerant folks to be at a loss what to substitute it with! Not to worry, you can still have your share of satiating and delicious rotis without using wheat flour. Each gluten-free roti in this section is designed in a beautiful way to ensure that it is finger-licking tasty! Combine flours like bajra, jowar or ragi with simple spices or veggies like mooli, methi or garlic, and watch (oh, taste) the magic unfurl! 1. Jowar Flour (Sorghum/White Millet Flour): This flour is made from whole dry jowar and is creamy white or yellow in colour. Being low in fat and high in protein, it provides with a healthy gluten free alternative. It is popularly used in some Maharashtrian delicacies and in many Gujarati snacks too. Pancakes or dosas can be made crispy by adding a little jowar flour to the dosa batter. Jowar flour has also gained popularity in gluten free baking. It is difficult to make dough from it due to it not being so elastic; it is mostly rolled between two sheets of plastic or shaped by hand. 2. Ragi / Nachni Flour (Finger millet / Red Millet Flour): The flour from these tiny red grains is reddish brown in colour. It has a slightly bland flavour and a nutty aroma. It has a high nutritional content, especially calcium, iron and protein. It is used widely in Karnataka, the most popular preparation being Ragi Mudde. It is also used to prepare Indian breads like bhakri, pancakes, Ragi roti and dosas. 3. Bajra Flour (Pearl Millet Flour/Black millet flour): Bajra flour is made from the small round grains of black millet. Bajra flour is greyish in colour and has a slightly nutty flavour. It is most commonly used in winters. It is known to be a multi-nutrient as it is rich in protein, iron, calcium, folic acid, magnesium and zinc. Being highly alkaline in nature, it is known to be good for those who have acidity problems. We suggest you try Stuffed Bajra Roti and Bajra Aloo Roti. It is mixed with other flours to make some Indian breads like bhakri, theplas etc. One can innovate and add a variety of fillings to make stuffed bajra parathas. 4. Rajgira flour (Amaranth/Ramadana flour): It is obtained from Rajgira / Ramadana which is the seed of the Amaranth plant. It is a very rich source of protein, calcium and iron.It is usually used during fasts to prepare ladoos, puris, theplas etc. 5. Soya Flour: Soya flour is pale yellow coloured flour and is made from whole soyabeans that have been roasted and ground. It has a peculiar nutty flavour and odour which is rare in other flours. It is high in protein, fibre, calcium, iron, vitamin A, vitamin B and zinc. It is extremely useful to build strong bones and enhance iron levels in the body. 6. Buckwheat (Kuttu) flour: It is called "Kutti-no daro" in Gujarati and "kutto" in most other Indian languages. It is a fine powder with a slightly sour flavor and is popularly used during the nine day Navratri fast to prepare dhoklas, pancakes, puris etc. Try Suva Buckwheat Roti. Buckwheat is rich in protein and calcium which is needed to build strong bones. It is rich in fibre and has the highest amount of iron amongst the flours. 7. Rice flour /Brown Rice flour: Rice flour / brown rice flour is the finely ground powder of de-husked rice. Brown rice is also called “unpolished rice” and is healthier than white rice flour because of its high fibre content. We suggest the popular Mahrashtrian bread called Chawal Bhakri had with Red Chilli Thecha. Though white rice is moderately high in protein, it is also rich in carbohydrate content (starch). Therefore, it is advisable to restrict its quantity and have it in combination with vegetables. It is an essential part of south Indian cuisine and is used to make dosas, upma and many savoury and sweet snacks. 8. Besan (Bengal gram flour): Bengal gram flour is made from 100% pure chana dal and is rich in protein, carbohydrates, calcium, folic acid, zinc and potassium. It is most commonly used for preparing many savoury and sweet snacks; onion bhaji, traditional potato and vegetable pakodas being the most popular ones. Coarsely ground besan is also used in the preparation of some famous Indian sweets like mohanthaal, mysore pak, laddoos etc. 9. Maize flour (Makai ka atta): Maize flour is made from dried corn and is milled from the whole corn kernels. It is yellow, coarse and odourless flour with a slightly sweet flavour. Try the Makai Methi Roti. In India, it is used to prepare snacks like dhoklas, pancakes etc. Mexican cuisine has an array of dishes like tortillas, tacos, nachos where maize flour is the main ingredient. 10. Cornflour: Cornflour is derived from the starch of the corn kernels. It is white in colour and has a soft and fine texture. It is odourless and has a mild taste. Cornflour is known for its lump free thickening properties – since it blends easily when combined with a cold liquid, it eliminates the hazards of lump forming. It is used to prepare pancakes, crepes etc. and as a binding agent in various snack preparations like tikkis etc. In Chinese cuisine, it is extensively used as a thickening agent in soups, sauces and gravies. 11. Arrowroot flour: It is ground from the dried roots of the Marantha plant (also called Paniphal, Tikora), and is very useful as a thickener. This fine whitish flour is tasteless, and becomes clear when it is cooked, which makes it ideal for thickening sauces. It is high in fibre and is easily digestible. It is also rich in calcium and potassium. This is used during fasts. It is also used as a thickener for clear fruit sauces, gravies, soups etc. Due to its binding properties, it finds use in baking too. The methi used in combination with makai ka atta makes a delectable variation of the traditional makai ki roti. A bowl of thick curds is all that is required along with these roti to make a satisfying breakfast or a quick meal. An interesting mix of spices perks up the taste of bajra in these famous rajasthani style rotis. While potatoes are used to help better bind the flour, be careful when you roll out the rotis so that they do not break.